Have you ever found yourself in a garage that looks more like a bicycle graveyard? Whether you have outgrown a bike, switched styles or upgraded, it’s not uncommon to find yourself with a couple bicycles hanging around in the basement. Rather than holding onto them, donating is a great way to clear out your space, recycle, help someone in need of a bike and get involved in your local community. Many bicycle donation centers repair and refurbish bikes to be resold at a low-cost to local residents. 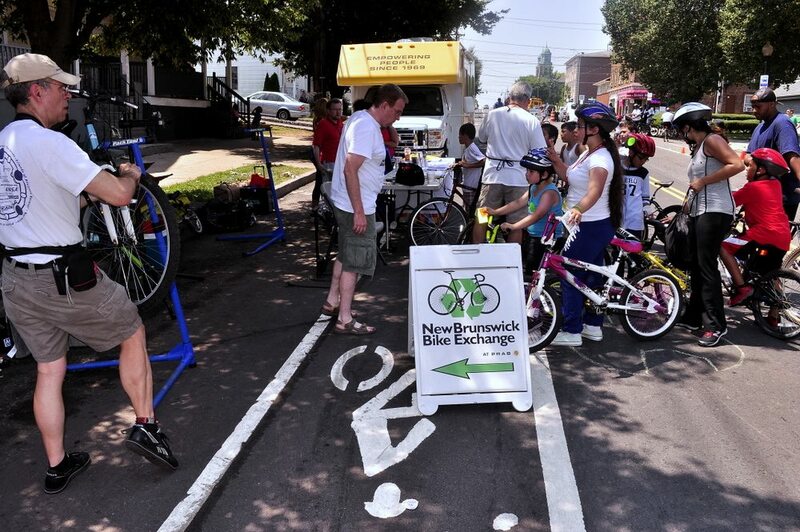 There are a number of organizations in New Jersey that you can help out by donating a bike, hosting a bike drive, or volunteering! Throw your old bike in the trunk and head out to one of these NJ bike donation centers to drop it off! Second Life Bikes is a bike shop in Asbury Park that is also an active participant in the community and allows volunteers to put in hours in exchange for a bike! Leadership Somerset is currently working with Agape house, a homeless shelter in Somerville, to provide residents with bikes that would allow them to travel and buy groceries, receive healthcare, attend job interviews and have the freedom of self-reliant transportation. If you don’t see a bike donation location in your county, look around in the local paper for announcements, bike drives often pop up randomly and are held for brief periods of time. You could also consider hosting a bike drive yourself! If you are looking for a team-building activity for your community group, school, church, workplace, or neighborhood hosting a bike drive is a great way to get your organization to work together for the benefit of the environment and the community. To host a bike drive you should first think through the following questions. When and how long are you going to be accepting donations? Where are you going to have people drop off the bicycles? 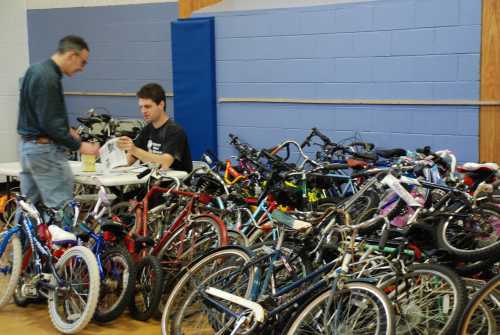 Generally, a bike drive will collect donations one location before transporting them to the local bike donation center. Which donation center will you be working with? Have you contacted them about dropping off donations? 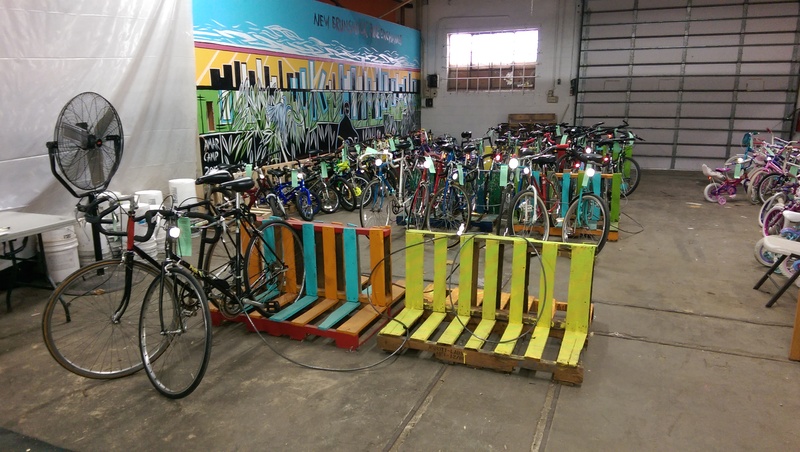 Do you have enough volunteers to help you accept and sort the bicycles? Do you have a vehicle large enough to bring the bikes to the donation center? Do you have tax deductible forms for people who are interested in documenting their donation? Once you have answered the previous questions and have a framework for the event, make sure to promote the event in every way you can—contact your neighbors and co-workers, post flyers, make facebook groups, etc. Give yourself ample time to get the word out about the event and don’t be afraid to call people and remind them! Good advertising and enthusiasm go a long way in planning a bike drive. Perhaps you don’t have a bike to donate or are looking for one—bike shops and bike exchanges are great places to meet new friends, get an affordable bike and pick up some basic mechanic skills! Most places operate as non-profits and oftentimes they are run 100% volunteer-based, so they are always looking for help. If you don’t have any mechanical skills, there are a number of jobs you can tackle such as working the register, maintaining the shop, communicating with people running bike drives, helping customers and picking up donated bikes. That being said, most locations provide the opportunity to learn and practice your skills as a bike mechanic. Donating an old bike to an exchange not only promotes sustainability, but also access to affordable bikes for those who may not otherwise have a form of transportation. Sharing access to bikes gets more people moving and interacting with the community around them. It not only promotes a healthy, active lifestyle, but it connects people to their physical environment, promoting awareness of the area and cultivating a sense of belonging. So give thanks and give back, the holidays are a great time to reconnect with your community! Posted on November 23, 2016 January 17, 2017 by soniaszczesnaPosted in Community EngagementTagged bike drive, community engagment, donate, New Jersey, recycle, volunteer.